Those who have, over the years, expressed strong skepticism over the possibility of members of the Franklin expedition indulging in cannibalism take note: here is evidence, once more, of the fact that in the most desperate mad horrific of times, English people would east English people. It's a testimony to the ability of forensic science to re-construct and understand the acts of people who, on the edge of their own annihilation, reached for the "last resource" -- the bodies of their own dead. One should emphasize that, in both the case of Franklin's men and the Jamestown settlers, we have no indication that anyone actively sought to kill anyone else for the purpose of eating them. But, once dead, it's clear that human remains, and the promise of survival, however slender, that they offered, were irresistible to their comrades in the depths of despair and hunger. Cut marks are again the key clue. In the skull of the teenage, upper-class 14-15-year-old dubbed "Jane" by those who studied the remains, the evidence is grisly. Clearly, whoever was seeking nutriment from this skull did not know how to go about doing so; there were three axe-blows on the side of the head, and three more severe ones at the back on the cranium, before the skull was actually split; this was followed by the use of a crowbar to break the shattered skull open. There are also a number of lighter cut-marks, probably produced by a knife rather than an axe, which indicate prior or further attempts to deflesh the skull; it is these cut-marks which are most similar to those seen on Franklin remains. Collectively, they tell of the attempts of a person unacquainted with butchery to butcher a fellow human being. Brains of other animals were eaten by English folk of the Jamestown era -- indeed, their overall diet back home would have had its share of organ meats, intestines, and other animal parts far less commonly eaten by humans today. So their desperation had, in a sense, a goal perhaps less grotesque to the Jamestown settlers than to us today. 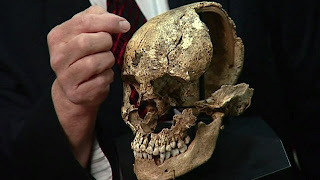 There are a number of resources and news stories online today about this finding -- the Smithsonian's site has the best, including an article in Smithsonian Magazine, as well as this video with the lead investigators, which also shows the reconstructed head of "Jane." From the content of her teeth, she seems to have enjoyed a higher-protein diet, which makes it more likely that she was one of the upper classes and not a servant. No one likes to imagine cannibalism. But no one should think that, in the worst of circumstances, people of any culture or nationality are immune to it. It's not a pleasant mental image, is it?. But survival cannibalism has happened in the past, and will happen in the future too, whether some people choose to deny it or not. The Andes flight disaster (1972) comes to my mind. I have a couple of books about this horrible, unbelievable ordeal, and you can't blame those brave men and women, you just can't. It's a fascinating story of survival, hard decisions and love to life. Anyone solely focusing on cannibalism is missing the point, in my opinion. The same applies to the Franklin expedition story. Actually the difficulty in believing that members of the Franklin Expedition engaged in Cannibalism is not surprising. Certain very ingrained attitudes made cannibalism a unmentionable taboo among mid 19th century Englishmen. So they dismissed the stories of the Inuit about finding butchered human remains. And instead embraced stories of butchering, murderous Inuit. All of which were created out of whole cloth. There was in Victorian times the infamous story of the Mignonette case in which several starving desperate desperate men kill a cabin boy named Richard Parker and eat him. After words they were charged with murder, (Case R. v. Dudley) and convicted and sentenced to death. A fair number of Victorian's indulged in revolting hypocrisy over the whole thing, smugly congradulating themselves over theirt moral superiority. Queen Victoria expresse satisfaction over the verdict. Fortunately the public outcry over he verdict was loud and the men were not executed by quietly freed a few months later. The brother of Richard Parker, a seaman, publically shaked the hands of the three men accussed and said there was nothing to forgive. So yeah there was a lot of hypocrisy about survival cannibalism in Victorian England. There is definitely a difference between killing a living person with the intention of eating them and eating the already dead. It has crossed my mind (we will never know) that in their terrible situation these men may well have agreed that they could be eaten after they were dead ~ it's the most help you can be.